In today's world, more electrical energy is being generated at increasing levels of power, and more and more low power energy is being used for the transmission and processing of data. The result is vastly increased EMI RFI or noise.AC Filters and EMI filters will reduce radio and electromagnetic interference.This can disrupt, and even destroy, electronic devices: an unacceptable situation , and soon an illegal one in certain markets. The electronics industry must strive to protect equipment against such EMI RFI noise. Noise, or interference, travels two ways. 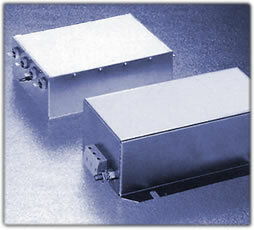 Switches - such as semi-conductors - can emit interference, and be susceptible to it. The same is true for data processing equipment. The most common method of protection is powerline RFI EMI filters coupled with screening or gasketting materials. The mains, or powerline filter is the very key element in eliminating mains borne interference. This EMI RFI filter not only has to meet the requirements of electro-magnetic compatibility (EMC), but safety aspects as well. For some applications, the EMI RFI filter also has to prevent the radiation of classified information from the mains line ('TEMPEST'). Other application require protection from destructive power line voltages, like those cased by lightning or nuclear explosion (HEMP). Fil-Coil's breadth of range, the high attenuation characteristics of our RFI EMI filters under various loads, our dedication to quality, and above all our organization's unique experience in EMI RFI filter design and manufacturing - spanning more than 25 years - is your guarantee of excellence. Fil-Coil's aim is to provide our customers with fault -free products. To ensure high quality we have instiuted a system which meets all the stringent requirements of the ISO 9001/EN 2001. The phrase 'Quality Assurance' is not just a slogan for us; it is applied in practice, and the Fil-Coil brand truly stands for reliability and quality in our RFI filter line. Fil-Coil's EMI RFI filter range provides an off-the-shelf solution for the vast majority of electronic equipment noise problems. Our standard product range is particularly wide, embracing both chassis-mounting and PCB-mounting types, allowing users to select an optimal choice in both performance and cost efficiency terms. 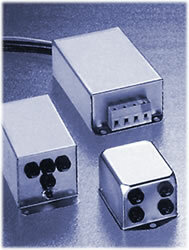 Fil-Coil, The Company With All the Solutions To All Your EMI RFI Filter Needs.